$2,800 below NADA Retail! CARFAX 1-Owner, ONLY 3,279 Miles! Sunroof, Heated/Cooled Leather Seats, NAV, WHEELS, 20" X 8.5" (50.8 CM X 21.6 CM) FRONT AND 20" X 9.5" (50.8 CM X 24.1 CM) REAR 5-SPOKE LOW GLOSS BLACK-PAINTED ALUMINUM SEE MORE! 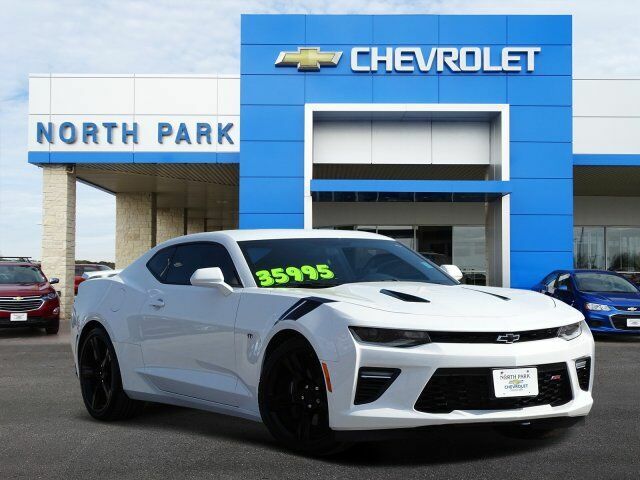 Leather Seats, Heated Driver Seat, Cooled Driver Seat Chevrolet SS with SUMMIT WHITE exterior and JET BLACK * INTERIOR TRIM interior features a 8 Cylinder Engine with 455 HP at 6000 RPM*. TRANSMISSION, 8-SPEED AUTOMATIC includes transmission oil cooler and (BTV) remote vehicle starter system, SUNROOF, POWER, AUDIO SYSTEM, CHEVROLET MYLINK RADIO WITH NAVIGATION AND 8" DIAGONAL COLOR TOUCH-SCREEN, AM/FM STEREO WITH SEEK-AND-SCAN AND DIGITAL CLOCK includes Bluetooth streaming audio for music and select phones; voice-activated technology for radio and phone; featuring Android Auto and Apple CarPlay capability for compatible phone and Shop with the ability to browse, select and install apps to your vehicle. Apps include Pandora, iHeartRadio, The Weather Channel and more, WHEELS, 20" X 8.5" (50.8 CM X 21.6 CM) FRONT AND 20" X 9.5" (50.8 CM X 24.1 CM) REAR 5-SPOKE LOW GLOSS BLACK-PAINTED ALUMINUM, ENGINE, 6.2L (376 CI) V8 DI, VVT (455 hp [339.3 kW] @ 6000 rpm, 455 lb-ft of torque [614.3 N-m] @ 4400 rpm) (STD). Rear Spoiler, Remote Trunk Release, Keyless Entry, Alarm, Electronic Stability Control, Heated Mirrors, Bucket Seats. This Camaro is priced $2,800 below NADA Retail.